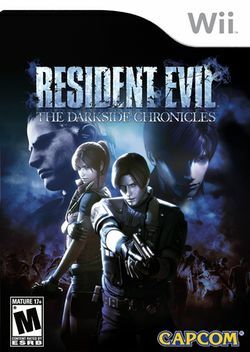 Resident Evil: The Darkside Chronicles, known as Biohazard: The Darkside Chronicles​ (バイオハザード / ダークサイド・クロニクルズ, Biohazard: The Darkside Chronicles​?) in Japan, is an on-rails shooter game for the Wii developed by cavia and Capcom. The game was released on November 17, 2009 in North America. It is to be released in Europe on November 27, 2009 bundled with the Wii Zapper accessory. The game's plot revolves around the personal stories and tragedies in the series. Its main focus is set on retelling the events of Resident Evil 2 and Resident Evil: Code: Veronica, with a new chapter being featured. For the Resident Evil 2 segment, the player takes control of protagonists Leon S. Kennedy and Claire Redfield, with Ada Wong and Sherry Birkin acting as supporting characters. The Code: Veronica chapter again features Claire, accompanied by fellow Rockfort Island prisoner Steve Burnside. Albert Wesker makes an appearance in a flashback. Chris Redfield also makes an appearance. This page was last edited on 9 July 2016, at 20:20.